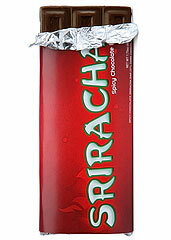 Odd Couple | Sriracha and Chocolate. Done. From time to time, you’ve dreamed about a chocolate bar made with your favorite spicy Asian condiment. But you always figured, like Yahoo Serious becoming a national treasure, it was something possible only in your dreams. Nope: turns out, this one’s real. Stimulate your sweet-hot tooth for Sriracha Chocolate Bars, a convenient alternative to squirting the rooster-branded, bright-red hot sauce on a Hershey bar, available now. This is like something out of a Wonka-ian acid flashback: a combination of candy and condiment, sugar and spice. Each bar is nearly two ounces of 57% dark chocolate, conceived in small batches, using innards-warming sriracha sauce. So picture it: you’re standing outside. It’s freezing out. The Patriots’ season is over. Tom Brady is probably sambaing in Brazil by now. You need something to lift your spirits. You’ll break off a quadrant from one of these bars and pop it in your mouth. And mixed with an entirely unfair blast of Atlantic air, this may just be the perfect blend of sweet and garlic-chili hot to get you through the day. Or get chocolate on your cufflink. Careful.